Denver, the "Mile High City," is so named because it sits officially at 5,280 feet above sea level. The city itself rests on the plains a mere 30 miles from the foothills of the Rocky Mountains, which provide a magnificent backdrop. The city was formed in 1858 due to a modest gold find not far from the current downtown, not because the location was a convenient spot along a transportation route as is the case with most cities. While most out of state visitors view Denver as a mere stopover on their way into the mountain resorts, there are plenty of things to see and do if you find yourself here for a visit. Of course, the mountains will beckon, but reserve at least a few hours to see what Denver has to offer. 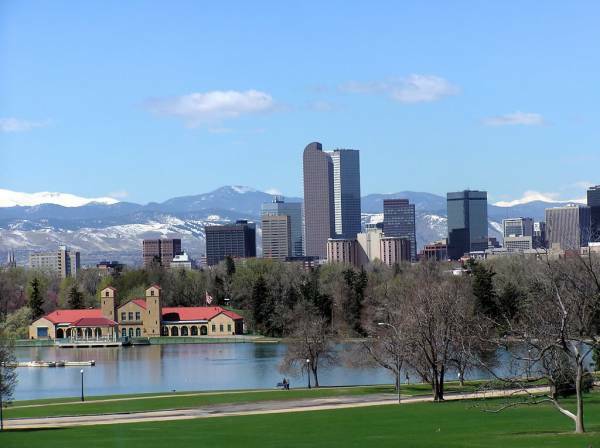 Denver boasts more than 300 days of sunshine each year, more than both Miami and Los Angeles, and an arid, mild climate. There's a saying repeated by locals: if you don't like the weather, just wait a few minutes. Rain never lingers for very long. But be prepared for quick and wide temperature changes. Make sure to drink lots of water, as the high altitude and arid environment can cause dehydration or altitude sickness. Altitude sickness can result in headache, nausea, and shortness of breath. The air is thinner than at sea level, so you may find yourself out of breath faster, especially during physical activity. Drinking alcohol can also contribute to the effects of altitude, not to mention that the effects of alcohol are felt faster than at sea level. Denver is southwest from Denver International Airport (DIA), about a 25 minute drive. Catch a shuttle or cab from the airport, or grab one of the five "skyRide" bus routes run by the Regional Transportation District (RTD). Several rental car companies have pick up locations on the outskirts of the airport. Catch a shuttle for each specific rental company in the lower terminal pickup area just outside baggage claim. Note that you may likely need a reservation before boarding a shuttle. The rental locations are in separate buildings, and shuttles will service only their specific company's location. Driving from DIA Airport: leave the airport on Peña Blvd. Merge onto I-70 West. Exit onto I-25 South (toward Colorado Springs). Take exit 212C for 20th St.
From North: Take I-25 South (toward Colorado Springs). Take exit 212C for 20th St.
From South: Take I-25 North (toward Fort Collins). Take exit 212C for 20th St. The public transit system is called the Regional Transportation District (RTD), operating buses and a lightrail system. The bus routes run throughout the Denver metro area, and connects with Golden and Boulder. The lightrail routes go south to Littleton and Lincoln, and more recently connected with the Jefferson County Government Center in Golden to the west. RTD also runs a free shuttle, the MallRide, along the 16th Street Mall, between Union Station and Civic Center. RTD Website. Average temp. (High/Low in Fahrenheit) on top, average precip. (inches) on bottom.